In northwest Gainesville, Florida, Trinity United Methodist Church has developed a new playground on the church property that will be completely compliant with the Americans with Disabilities Act. The new playground includes a Noah’s Ark with Bible verses in Braille, a chapel with specially designed wider doorways, removal of other wheelchair barriers, and a special wheelchair gondola so that all children can swing together. 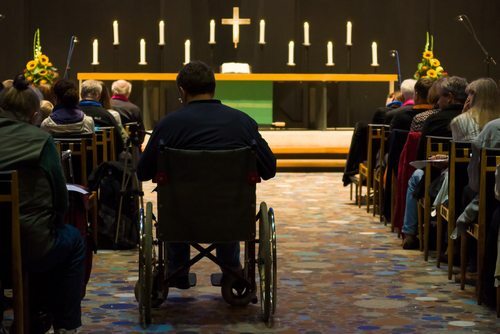 There is a religious and a moral rationale for religious institutions to become ADA compliant. Although a recent article in the Press & Sun Bulletin erroneously characterizes churches as public buildings subject to the ADA, the churches in the story that are making accommodations for persons with disabilities—Endwell United Methodist Church in Endicott providing large print hymnals, St. James Church in Johnson City and St. Francis of Assisi Church in Hillcrest using sign language interpreters, Trinity Memorial Episcopal Church in Binghamton devoting a section of the church for persons in wheelchairs—seem to be motivated by religious conviction. “The ADA calls us to be aware of and correct what we do that unnecessarily excludes people. We obscure our role and responsibility if we think the ADA invites us to do good works instead of it calling us to examine what we do and to stop harming or excluding people who have an impairment.